Let me introduce you to the project I'm currently working on. 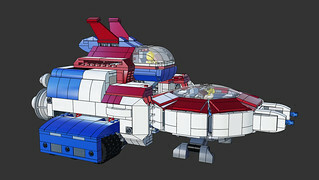 It is a MOC of the space shuttle in "Ulysse 31". (from the left to the right) Thémis, Ulysse, Télémaque and Nono. 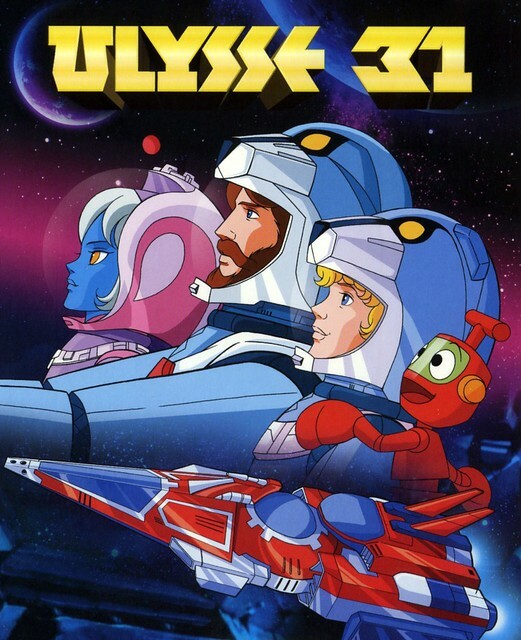 For the record, "Ulysse 31" is a Franco-Japanese cartoon released in the 80s. It's a kind of Homer's odyssey in a Space Opera style. We follow the story of Ulysse who, to save his crew victim of a curse, will have to, with his son Télémaque, Thémis and Nono the little robot, wander in the Olympus to the kingdom of Hades. For those interested in the series, the episodes are available on YouTube. 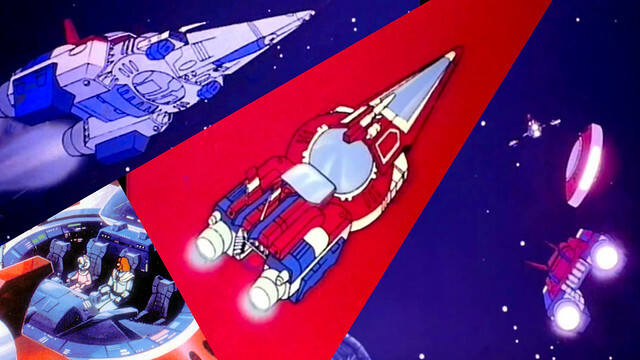 This space shuttle (to my knowledge) has no particular name, but once divided, the three little ships have their own names: Dardos, Orbos & Virès. 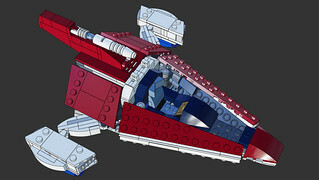 My main goal is, of course, to create a MOC as faithful as possible to the original. However, I am not trying to make a simple model, but a real set with the maximum of playability. That's why I set myself some goals to achieve in the shuttle conception to provide the best gaming experience possible. 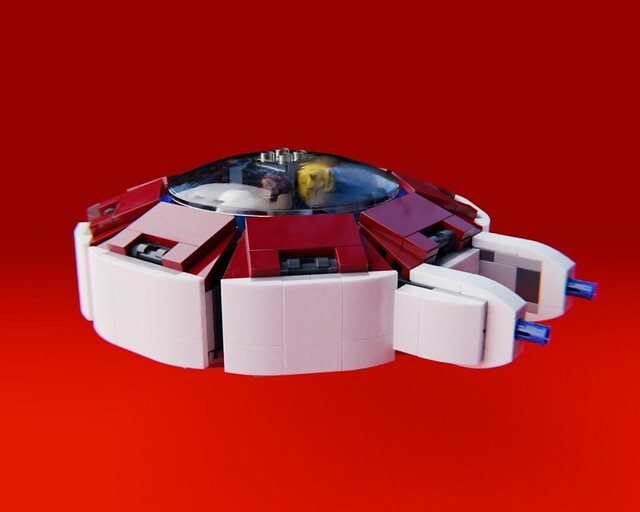 The ultimate goal being to submit this project on Lego Ideas. 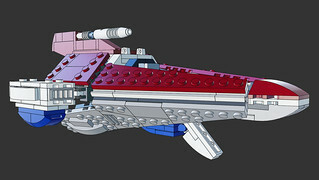 And finally, here is a quick rendering of the current status of the ship. Still in progress. More detailed pictures will come soon, when I will have finish the global shape. I hope you will like this project. Will be really interesting to follow this project. I have never heard of the series but the work you have done so far looks very good! Excited to see more of the project in progress! Don't know the story, but your model is great and I will certainly support it once it's on Ideas! Keep up the good work! Also have never heard of the show, but it's a fascinating concept and your recreation looks amazing! Looking forward to future progress! I do not know if the series has been broadcast in many other countries. I think so. But it is probable that it did not meet the same popularity as in France. Not many changes since the last time. 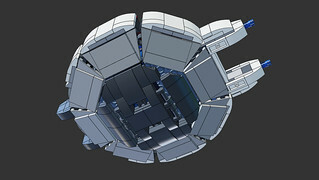 I'm still trying to finish the global shape of the space shuttle while I'm starting to detail some parts. Dardos is the first part of the space shuttle. It is, most commonly, Télémaque’s spaceship. It has the shape of a tip. 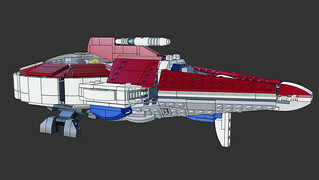 Its maneuverability and speed make it an excellent fighting spaceship. Dardos is much more difficult to achieve than expected. 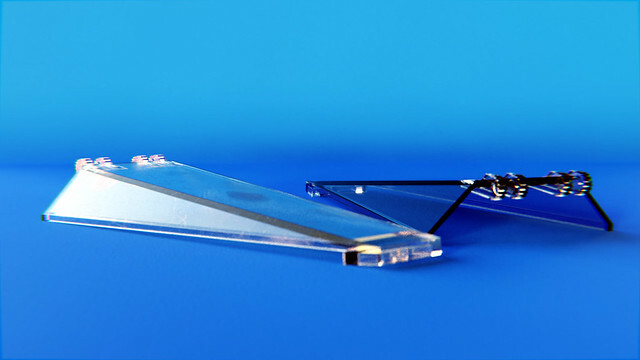 Its shape imposes to orient triangular panels in a very precise way that I have difficulty to reach. And its relative small size makes the mechanism complicated to integrate. I had hoped to add side landing gear, so I may have to forget about this idea. I should still be able to integrate the system that allows the deployment of side stabilizers (white thrusters). Orbos is the main part of the space shuttle. It is Ulysse’s spaceship. It has the shape of a saucer. It can accommodate four passengers, including the pilot, in its cockpit. 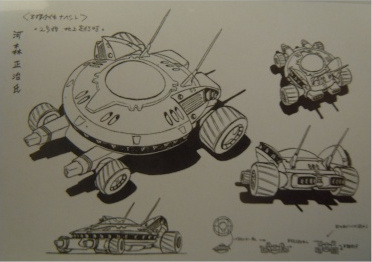 It can turn into a kind of all-terrain vehicle for exploration on the planets. Orbos caused me some difficulties in achieving its octagonal structure. At first, I did not expect it as big. But the space occupied by its structure pushed me to reconsider its proportions. Which led to a much better end result than I imagined at first. I still have to find a way to hide the joints of the small trapezoidal panels. And, why not, adding landing gear. Regarding its transformation into an all-terrain vehicle, I think about the possibility of extensions that we will fix in Orbos. An internal deployment mechanism is impossible. Virès is the last part of the space shuttle. It is, by default, Thémis’spaceship. It has the shape of a tank. Not very maneuverable in space, it can however be very fast thanks to its two powerful reactors that propel the whole space shuttle. On dry land, it's something else. 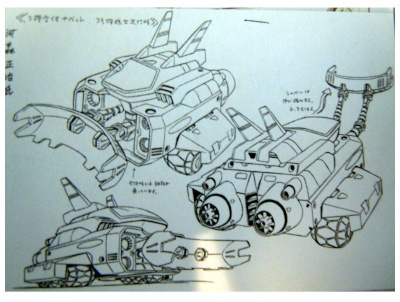 With its six large motorized wheels and its tank look, it's a real monster! Nothing can resist it. Virès should, in its final version, be very different from the original version. In its original version, when its six wheels are out, its two lateral parts slide inwards to form a less wide Virès. Technically, it's quite feasible, but I find it a shame to waste so much space. Space that I would prefer to use to build a cargo hold that could accommodate a lot of things. 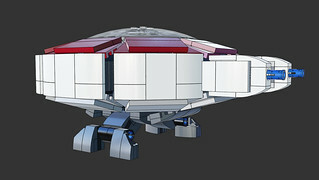 Edit: A last render of the whole spacecraft. It's been a while I did not post updates for this project. I did not have a lot of time this last past months to work on it. But this is not dead ! And that's why I'm going to show you the little improvements I made since. I think I am finally done with the structure of Dardos. I am happy with the shape, the thrusters can finally deployed and I added a front landing gear. I have still to deal with some details and it will be finished. Orbos did not change a lot. As Dardos, I finally added its landing gear and made some improvements in the cockpit. I will maybe have to change the connection system with Vires. I still have a lot of problem with Vires. I finally decided to made a system that allows to retract the lateral parts of the spaceship but I would also like to have a kind of cargo bay inside it. So I am trying to find a way for having both... I also added its front blade. I am not very happy with the shape but this is the best solution I found to keep it retractable. I made the landing gears for each spaceship in a way that whatever the configuration (Dardos / Orbos, Orbos / Vires or Dardos / Orbos / Vires) the assembled spaceship can always be landed. 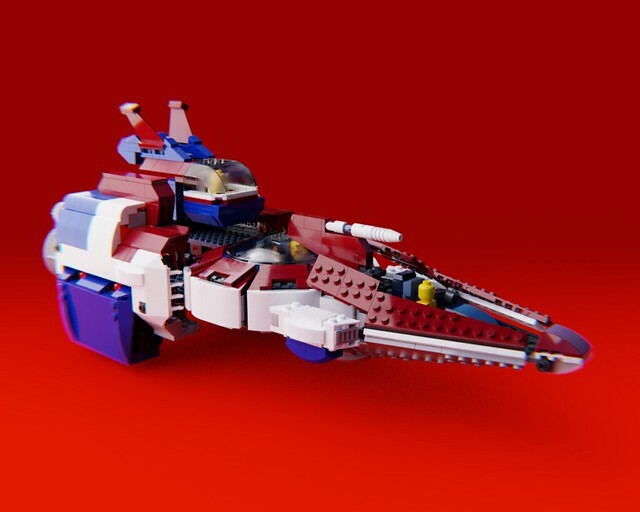 And finally, I made the little speeder. 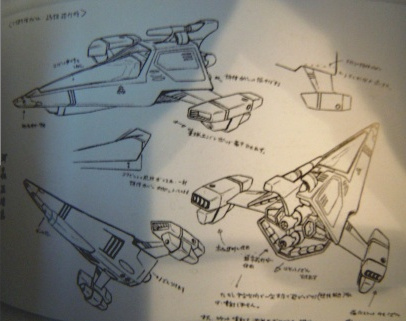 If it is possible, it will be parked in the cargo bay of Vires. I just started to create the custom parts I need for my project. The first is the windscreen for Dardos. 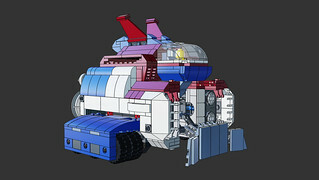 Because I did not find any windscreen that would suit for Dardos among the official Lego parts, I decided to create it. Here are the first renders. Hey, I just started to create the custom parts I need for my project. The first is the windscreen for Dardos. 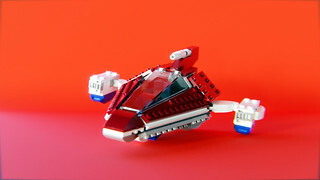 Because I did not find any windscreen that would suit for Dardos among the official Lego parts, I decided to create it. Here are the first renders. [center][url=https://flic.kr/p/2dQ1Kj1][img]https://farm8.staticflickr.com/7851/46488311264_15a059110d_z.jpg[/img][/url][/center] [center][url=https://flic.kr/p/2eVVPyr][img]https://farm8.staticflickr.com/7873/47211605741_45fdc66446_n.jpg[/img][/url][url=https://flic.kr/p/24jteBn][img]https://farm8.staticflickr.com/7839/40246773583_b77efcd0c9_n.jpg[/img][/url][/center] Thanks! That windscreen is epic, but I'm pretty certain that one of the rules says no suggesting new pieces, because they won't make them. 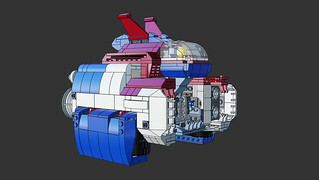 "Your models may only use existing LEGO parts. We do not allow suggestions for new LEGO parts. 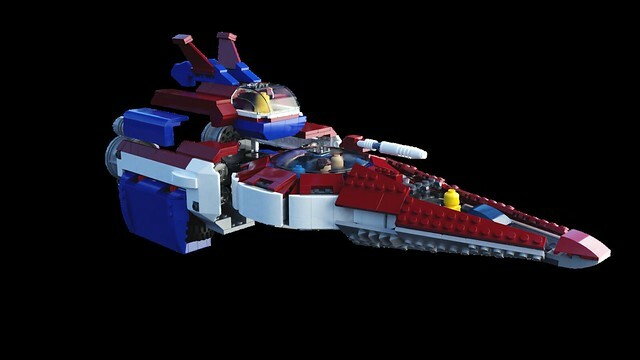 Product ideas may only contain genuine (not cut, glued, or modified) LEGO bricks. 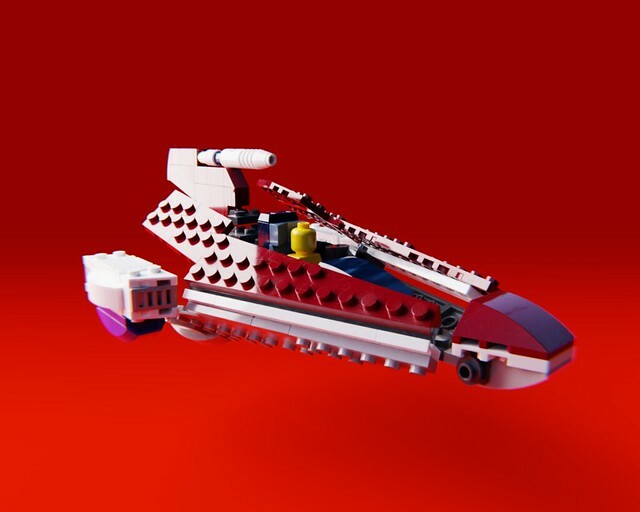 Proposals for new LEGO parts (of any material), competing brand building bricks, or “aftermarket” elements manufactured and sold by any third party are not allowed. Existing parts in different colors, new stickers, and printed parts are welcome." That windscreen is epic, but I'm pretty certain that one of the rules says no suggesting new pieces, because they won't make them. 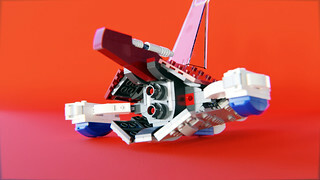 :/ EDIT: According to the IDEAS guideines: "[b]Your models may only use existing LEGO parts. We do not allow suggestions for new LEGO parts. 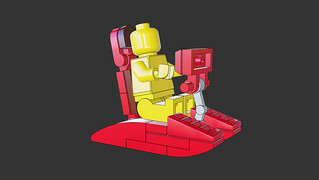 [/b] Product ideas may only contain genuine (not cut, glued, or modified) LEGO bricks. 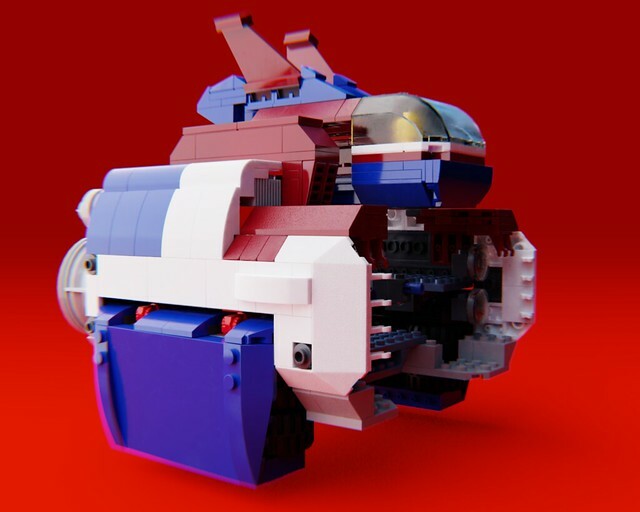 Proposals for new LEGO parts (of any material), competing brand building bricks, or “aftermarket” elements manufactured and sold by any third party are not allowed. Existing parts in different colors, new stickers, and printed parts are welcome." Arf ... I forgot about that.